One of the maladies everyone experiences but no one likes to talk about is constipation. Constipation can be caused by a number of factors like poor diet, medications, changes in lifestyle or even aging. While there is no shortage of over-the-counter medicines to combat constipation, sometimes simpler is better. Virgin coconut oil has several beneficial applications, one of which is dealing with constipation. Coconut oil speeds up metabolism, thereby cleansing your body of excess waste. 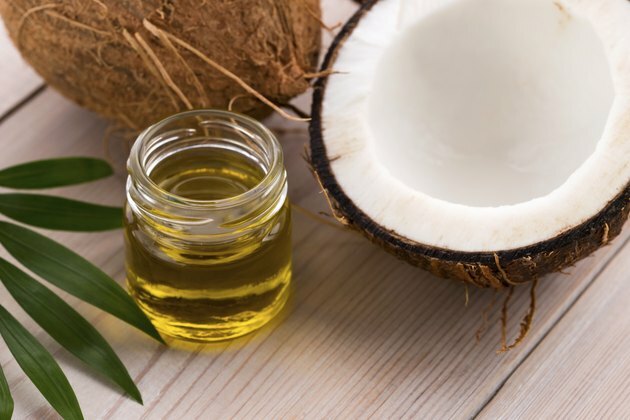 Adding coconut oil to your daily routine may relieve your constipation. Measure out ½ tsp. of virgin coconut oil and stir it into an 8-oz. glass of juice. Drink the entire contents of the glass. Choose a juice that is 100 percent natural, not one that is full of sugars or from concentrate. Repeat three to four times per day at least 30 minutes before each meal. Increase the dose by ½ tsp. per day until you are consuming 3 to 4 tbsp. every 24 hours. Gradually increasing the quantity will give your body time to adjust. Avoid processed foods, sugar and fatty meats while you are using the coconut oil, as such foods can contribute to constipation. Instead, increase your intake of fruits, vegetables and water which can all help improve digestive health. While fighting constipation, you should also avoid artificial sweeteners.